One of my favorite plug-ins for Adobe Photoshop is Knoll Light Factory, by Digital Anarchy. Originally created by Photoshop’s co-creator, John Knoll, Light Factory was created to produce the photon torpedo effect for the Star Trek movies. As you can see by the screenshot below, Light Factory offers a plethora of options in the Preset list on the left side. You simply double-click the elements you wish to apply to your image. A running list of your selected elements—Elements of Light—is shown on the top right of the dialog window, and you can selectively turn them on and off to view the results of different settings. Just below the Elements of Light list are the Element Parameters, where you can fully customize each effect individually. Once you customize each Element, you can adjust the overall effects of the Light Elements just below the large preview image. And unlike Photoshop’s built-in lighting effects, Light Factory allows full control over the movement of the lighting in your image. Just click and drag the flares around in the preview image. As you can see by the image above, once you combine the lens flares Knoll Light Factory creates with other elements of your image, the results can be quite spectacular. But don’t let my screenshots fool you. Knoll Light Factory can be used to create more than just exploding planets in space—try enhancing sunlight in your landscape photos, or making that candle in a photo of a warm holiday scene brighter and more. The standard disclaimer applies. Using filters can make a good image great, but if overdone, it can also make it look cheap and, well, Photoshopped. The $149 Knoll Light Factory 3.0 is a Universal Binary plug-in, compatible with Photoshop 7.0 through CS3 and Photoshop Elements 3.0 and 4.0 (and Elements 5.0 on Windows), and a demo is available for you to play with. 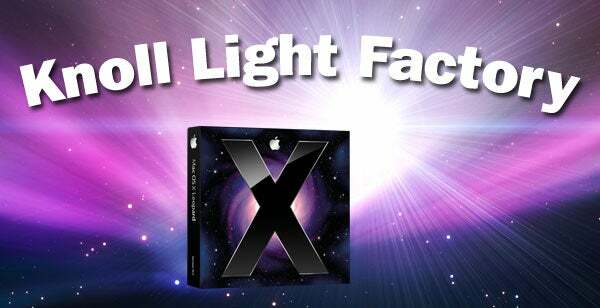 It works perfectly on my Mac Pro running Leopard and Photoshop CS3—if you work with a lot of images and like to bring a little extra to the lighting, this plug-in is well worth having.